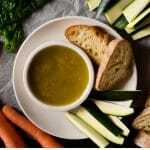 This Bagna Cauda recipe is made with only four ingredients; anchovies, garlic, butter and a little olive oil. Made for dipping vegetables and crusty bread into it's the most delicious and simple appetizer. First, prepare your choice of vegetables and bread for dunking. You can choose whatever you prefer, cut into slices ready to serve. Heat a little oil in a pan and add the anchovy fillets and crushed/minced garlic. Heat the anchovies and garlic until the anchovies dissolve and mix in with the garlic. Give it long enough so the garlic is cooked but not browned or burnt. Add the butter then remove the pan from the heat. Whisk the butter, anchovies and garlic together until it's all thoroughly combined then transfer the dip into a warm ramekin and serve. Bagna Cauda is traditionally served with raw or boiled vegetables such as cardoons, zucchini, carrots, radishes, cauliflower, artichokes and fresh crusty bread for dunking. Serve the dip in a warmed ramekin.